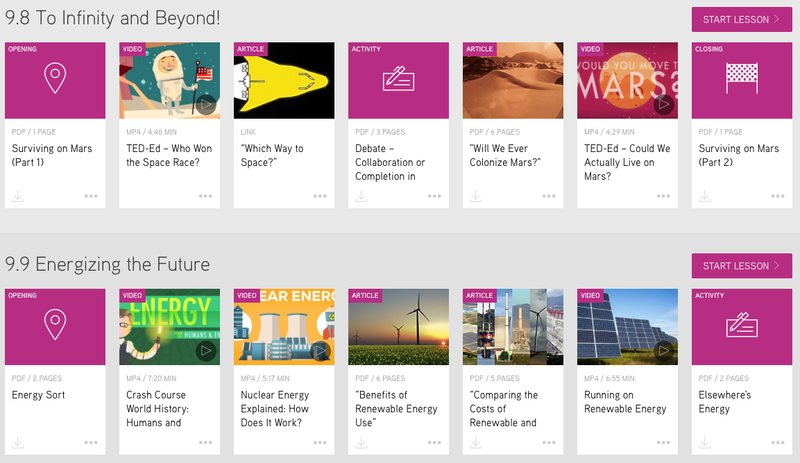 Each year, we update the Big History Project course with new assets and activities to help keep it fresh and address feedback from our teachers. We’re pleased to announce that as part of this year’s update, we’ve added a set of 11 new science lessons. Co-developed with our friends at the Space Science Laboratory at the University of California–Berkeley, these lessons take the science in the course a level deeper. 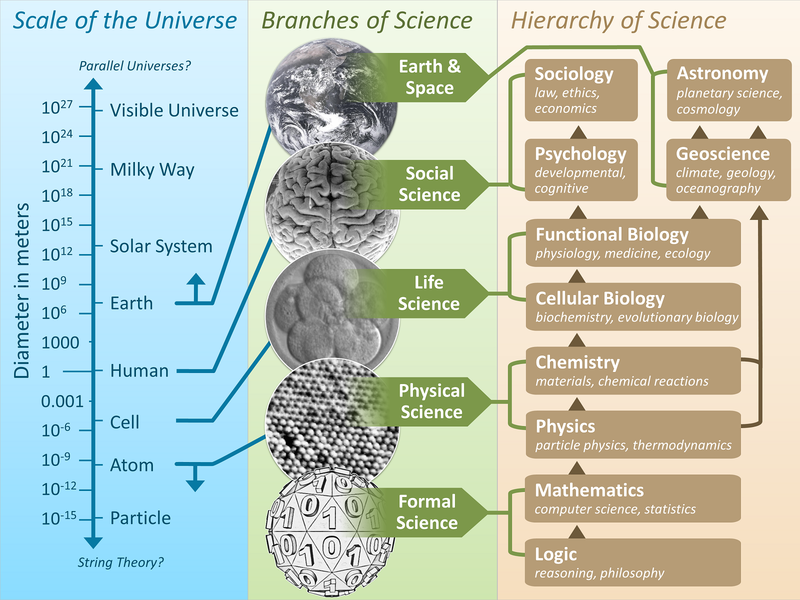 The scale of the universe mapped to the branches of science and the hierarchy of science. By Efbrazil – Own work, CC BY-SA 3.0. The Big History Project course (BHP) talks about science. A lot. We start with the Big Bang, and from there we look at the formation of stars, chemical elements, the planets, and life itself. Yet, BHP is not a science course. It uses the insights of multiple disciplines—scientific and nonscientific—to inform our understanding of human history. Each of the science-heavy units looks at the collective learning of the scientists and scholars that developed the theories across generations and geographies. For many teachers and students, these are the best units in the course. The new lessons we’ve added help interested teachers explore the science of Big History a little more deeply with their students. These new videos, new readings, and other assets are designed to illustrate the core ideas while providing a new set of driving questions for students to explore. A short summary of the lessons follows here. As humans have devised ways to observe more and more in space, we’ve needed new kinds of yardsticks and clocks to measure the enormous distances between objects and to pinpoint key events using the scale of the Big History timeline. What does it mean for space to be expanding? And if everything is expanding, why isn’t the Earth getting further from the Sun, and our Milky Way galaxy getting further from the Andromeda galaxy? Why aren’t houses, humans, and hamburgers expanding, too? When astronomers first started looking at the stars, they had only the naked eye. All they noticed was that some stars were brighter than others and that they were different colors. Over time, groundbreaking techniques of observation have led to deeper understanding of the different kinds of stars. Lesson 3.4: How Old Is the Sun? The Sun shines, but why and for how long? Our understanding of the Sun fell short when it came to explaining the energy powering it. Then, along came Einstein. His work helped to explain our Sun and all the stars of the Universe. In antiquity, planets were thought to be gods wandering through the sky. With the invention of the telescope, they were revealed to be entire worlds, with a vast range of different characteristics. The past two decades mark the beginning of a new revolution in astronomy, as we start to find planets orbiting other stars and search for Earth-like planets outside of our Solar System. What happens when objects from space collide with the Earth? Space collisions and Earth impacts have been affecting the Universe since the beginning of time. What size space object would it take to trigger an extinction event on Earth? Lesson 7.3: What Should We Eat? As agriculture has moved from a mainly subsistence necessity to an overwhelmingly commercial enterprise, our ability to choose what we want to eat has steadily increased. We’ve had millennia to contemplate what foods are best for us; yet, the argument over what we as a species should be eating has never been more heated and bewildering. Lesson 9.8: To Infinity and Beyond! The twenty-first century has seen increasing involvement of private industry in space exploration. What does the future hold as humans contemplate settling on worlds beyond Earth? The availability of cheap energy has been the key to the rapid technological progress that began with the Industrial Revolution. But as fossil fuels become scarcer and our choice of energy sources influences our planet’s climate, where might we turn for the energy to power our future? Lesson 10.3: Are We Alone? Humans have long wondered if we’re alone in the Universe. Earth is just one planet in a Universe with trillions of planets. If we were to find life on other planets, would that become the next major threshold in Big History? What possible major breakthroughs in history might unfold from this point forward? We hope you’ll review these lessons and incorporate as much of the new materials into your teaching as you can. To help you get started with planning, we’ve created a sample BHP Science course plan in Word and PDF formats. Let us know what you think by posting comments in the BHP Science group on the BHP Teacher Community on Yammer. Although we’re particularly interested in hearing about how useful the new materials are for helping you focus on the intersection of BHP and science, we’re grateful for all of your feedback. There’s always so much that I have gained as a teacher from BHP…really happy to see the horizon and scope widen .